Welcome to The Shed Guy! Shed guy has been in the construction field for twenty plus years, fifteen of them building storage sheds and barns for the people of Western New York. My customers receive quality at a competitive price. Specializing in custom buildings to meet the need of your yard and budget. A standard line of buildings is also available, from an 8x8 on up. I look forward to meeting you and working on a project designed especially for you. 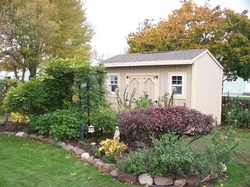 Shed guy has many more photographs available, and a list of satisfied customers. Call today and lets make this a reality for you. With Quality Storage sheds At A Great price.